Analysis of Hubble observations of the massive globular cluster NGC 2808 provides evidence that it has three generations of stars that formed early in the cluster's life. This is a major upset for conventional theories as astronomers have long thought that globular star clusters had a single "baby boom" of stars early in their lives and then settled down into a long, quiet middle age. 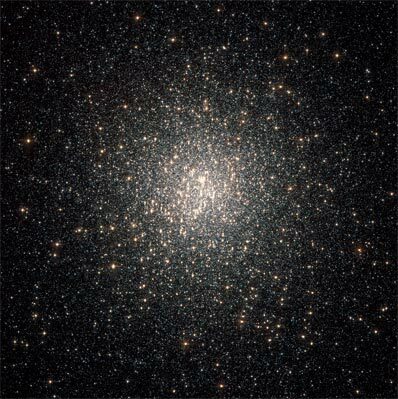 "The standard picture of a globular cluster is that all of its stars formed at the same time, in the same place, and from the same material, and that they have co-evolved for billions of years," said team member Luigi Bedin of ESO in Garching, Germany, the European Space Agency, and Space Telescope Science Institute in Baltimore, USA. "This is the cornerstone on which much of the study of stellar populations has been built. So we were very surprised to find several distinct populations of stars in NGC 2808. All of the stars were born within 200 million years very early in the life of the 13-billion-year-old massive cluster."